DuPont Elvanol polyvinyl alcohol (PVA) is used in the manufacture of spiral wound tubes, coated paper and linerboard, and specialty water-soluble films. Its higher binding capacity versus synthetic latex and starch make it attractive for use in coatings. It adds strength in recycle board and adds barrier properties for improved oil and grease resistance. 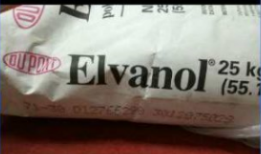 Pouches and sachets manufactured with films of DuPont Elvanol are water soluble, dissolving as they release their content into cold or warm aqueous solutions. Applications include water treatment chemicals, dyes, laundry detergents, agricultural chemicals, disinfectants, industrial cleaning chemicals and other areas benefiting from ready-to-use, pre-measured dosages or reduced packaging waste.